Two Lives, One Dream is an exciting and moving story about two ordinary people from opposite sides of the globe whose lives were woven together through shared passion and love. Sam and Nancy McBride were brought together from New Zealand and America to translate scripture into the Gimi language and take God’s Word to the Gimi people in the rugged highlands of Papua New Guinea. 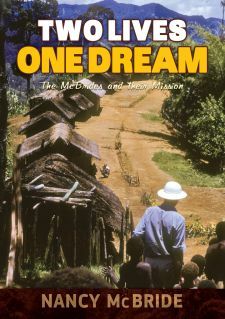 The McBride's journey led them through the heights of mountains and deeply etched valleys - through joy and sorrow - as the fullness of their dreams turned out to be more than they could have ever understood or imagined. This story, told firsthand by Nancy McBride, will inspire you to see how God crafts our lives so that we can serve others and glorify Him. This informative book will appeal to a wide audience. Nancy has written in a remarkable way. She uses humour and pathos.